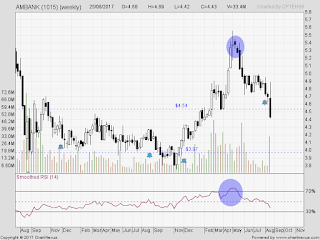 AMBank : Watching it dropping after the 'announcement'. This is a weekly chart ... take a note of the highlighted overbought region ... and read the candle sticks there ... it is a SELL around RM5.40 so that we could buyback lower. There is a confusion on how technical indicators being used. Use them sparingly ... do not over-rely on indicators and put many indicators in your chart. Waiting to buy AmBank around RM4, which I bought previously but sold too early. I found this post very informative. To gain useful insights about market traders can explore such posts. Better market returns can be earned by using financial advisory services at the time of trading.